This summer, Inter bought Milan Skriniar from Sampdoria in an operation in which the Slovakian was valued about 20 millions of euro and that also involved Gianluca Caprari as a quid pro quo. When the operation became official there was a bit of scepticism among the media and Inter fans: Skriniar had played a positive season in Genoa but made some big mistakes, especially during the first half, like the ones against Roma and Milan; during the second, instead, his performances improved. Now, after twelve games, the scepticism has vanished because the Slovakian centre back is playing very well, becoming one of the most important players in Spalletti’s squad. Milan Skriniar was born in 1995 in Slovakia. He started playing football in FK Žiar nad Hronom’s youth academy and then he continued in that of Zirina. He was bought by Sampdoria in January 2016 but he played only 104 minutes, distributed in three games. During the following season, under Marco Giampaolo’s guide, he became a regular starter and played 35 games in Serie A, attracting interest not only from Inter but also Juventus, Bayern Munchen and Borussia Dortmund. During 2017 he also became a regular starter in his national team: in fact, he played five of Slovakia’s last six games for the World Cup qualifications (in the one he lost, he was disqualified). Slovakia finished second in its group but was the worst second so it didn’t take part in the playoffs. He is a 1.87 metres tall, thin and slow centre back. During the 2016/2017 season he played as a left centre back and is now playing as a right centre back, which seems to fit him more. Skriniar is an excellent passer: he was and still is very important in his teams for his ability to build-up play from the back, but he is also good in the defensive phase. He covers his slowness with his smartness, positional awareness and long legs, which permits him to intercept a pass or win a one-on-one situation. Last season Inter struggled a lot in building actions from the back. Neither Miranda, Murillo or Medel (which, under coach Pioli, played as a centre back) had the qualities of build-up play. The maneuver was often slow and muddled, with too many passing mistakes. 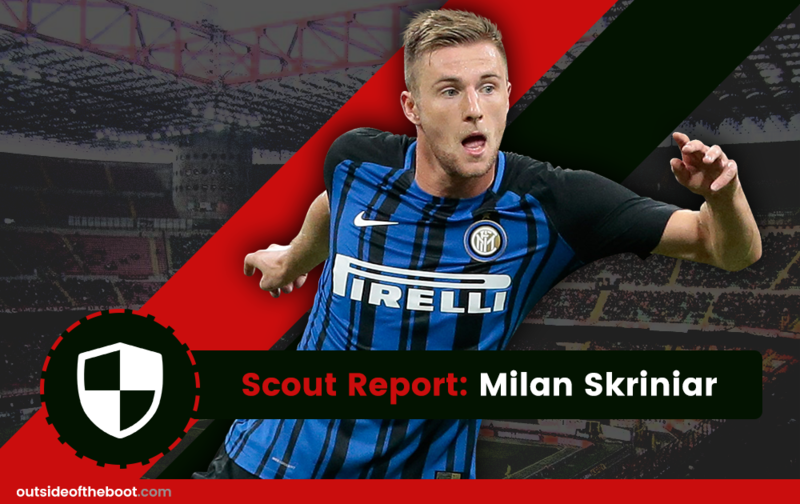 It was obvious the need of a centre back with good passing skills, so Ausilio and Sabatini chose Milan Skriniar, who, during the 2016/2017 season at Sampdoria, showcased his passing accuracy and vision of play. Since the first official game of the season against Fiorentina, Skriniar has been very important in the exit of the ball from the back. He is very accurate in short and easy passes but also when it comes to breaking the lines with laser passes (a pass that goes through one or more lines of opponents; for example a pass from the backline to the trequartista). Skriniar is the Inter player who completes more passes per 90 minutes (58.4) and has the highest precision rate (91%). He always plays with his head high in order to find a free teammate to serve with a vertical pass (generally he prefers to keep the ball on ground rather than play it in the air). Furthermore, despite his slowness, if he has space to drive forward, he is good at carrying the ball. His passing qualities are so good that he played as a defensive midfielder with his national team against England at Wembley last September. Despite the loss, he played very well, acting as shuttler in front of the defence and being good on the ball, even under pressure in tiny spaces (he made 4 dribbles). In the defensive phase his style of play is pretty conservative. Indeed, when the opponent receives the ball with his back towards goal, usually Skriniar doesn’t try to anticipate him; he prefers to wait and recover the ball lately. In contrast with most of the centre backs born in the 90s (like Umtiti, Varane and so on), he is not that aggressive and he likes to wait the right time to retain the ball. Thanks to his great positional awareness and his long legs he is very good in intercepting opponents’ passes, especially through balls and crosses. In this first part of the season he intercepted 1 pass and made 4.8 clearances per 90 minutes. Despite not having a great elevation, he is good even when the ball is in the air, thanks to his height and his positional awareness (during this season he won 66% of the aerial duels he played). He is also good in the opponents’ penalty area, where he can receive set-piece deliveries and find the goal with headed shots (just like he did in Inter – Sampdoria last month). When he is in one-on-one situations he often waits for the opponent to do the first move. He makes himself hunchbacked, with his knees slightly bent, and smartly watches only the ball without being distracted from opponent’s dummies, waiting for the right time to tackle. This style helps him to retain the ball even against faster opponents: indeed, for example, he made an awesome performance against Napoli, making seven successful tackles and stopping Mertens and Insigne several times. As I’ve already said, Skriniar is a very slow player. The positive results of all his defensive actions strongly depends of his concentration, smartness and positional readings. When some of these lack he can face difficulty and he doesn’t have the reactivity to make up for his mistake. It’s rare, but sometimes he is too confident with the ball at his feet and, if not totally concentrated, he can lose the ball in a dangerous zone of the field when an opponent presses him, just like Kalidou Koulibaly did in Napoli – Inter. Furthermore, if his right foot is very good, it’s not possible to say the same about the left (and it’s not a case that he almost never passes with the latter). Gabriele Gatti was born in Italy and has a Management engineering degree. He is a football writer and co-founder of the italian podcast Il Terzo Uomo.